For ither uises, see Rio Grande (disambiguation). "Río Bravo" redirects here. For ither uises, see Río Bravo (disambiguation). The Rio Grande (/ˈriːoʊ ˈɡrænd/; Spaingie: Río Bravo del Norte or Río Bravo, [ˈri.o ˈβra.βo]) is a river that flows frae soothwastren Colorado in the Unitit States tae the Gulf o Mexico. Alang the wey it forms pairt o the Mexico-Unitit States border. Accordin tae the International Boundary and Water Commission, its tot lenth wis 1,896 miles (3,051 km) in the late 1980s, tho course shifts occasionally result in lenth changes. Dependin on hou it is measured, the Rio Grande is the fowert or fift langest river seestem in North Americae. The river serves as a natural border atween the U.S. state o Texas an the Mexican states o Chihuahua, Coahuila, Nuevo León, an Tamaulipas. A vera short stretch o the river serves as the boondar atween the U.S. states o Texas an New Mexico. Syne the mid–20t century, hivy water consumption o ferms an ceeties alang the river haes left anerly 20% o its natural dischairge tae flow tae the Gulf. Near the river's mooth, the hivily irrigatit Rio Grande Valley is a important agricultural region. The Rio Grande is ane o 19 Great Waters recognisit bi the Americae's Great Waters Coalition. The Rio Grande's watershed covers 182,200 square miles (472,000 km2). Mony endorheic basins are situatit athin, or adjacent tae, the Rio Grande's basin, an thir are whiles includit in the river basin's tot aurie, increasin its size tae aboot 336,000 square miles (870,000 km2). Island athin the Rio Grande frae the North Valley in Albuquerque, New Mexico. The Rio Grande rises in the wastren pairt o the Rio Grande National Forest in the U.S. state o Colorado. The river is formit bi the joinin o several streams at the base o Canby Moontain, juist east o the Continental Divide. Frae thare, it flows throu the San Luis Valley, then sooth intae New Mexico, passin throu Española, Albuquerque, an Las Cruces tae El Paso, Texas an Ciudad Juárez, Chihuahua. Belaw El Paso it serves as pairt o the border atween the Unitit States an Mexico. The offeecial river border measurement ranges frae 889 miles (1,431 km) tae 1,248 miles (2,008 km), dependin on hou the river is measured. A major tributar, the Rio Conchos, enters at Ojinaga, Chihuahua, belaw El Paso, an supplies maist o the watter in the border segment. 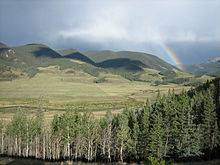 Ither well-kent tributars include the Pecos an the smawer Devils, which jyne the Rio Grande on the steid o Amistad Dam. Despite its name an lenth, the Rio Grande is no navigable bi ocean-goin ships, nor dae smawer passenger boats or cargo barges uise it as a route. It is barely navigable at aw, except bi smaw boats in a few places. The Rio Grande rises in heich muntains an flows for hintle o its lenth at heich elevation; El Paso is 3,762 feet (1,147 m) abuin sea level. In New Mexico, the river flows throu the Rio Grande rift frae ane sediment-filled basin tae anither, cuttin canyons atween the basins an supportin a fragile bosque ecosystem on its flood plain. Frae El Paso eastwaird, the river flows throu desert. Anerly in the sub-tropical lawer Rio Grande Valley is thare extensive irrigatit agricultur. The river ends in a smaw saundy delta at the Gulf o Mexico. Durin portions o 2001 an 2002 the mooth o the Rio Grande wis blockit bi a saundbar. In the hairst o 2003 the saundbar wis cleared bi heich river flows o aboot 7,063 cubic feet per second (200 m3/s). Millions o years ago, durin the Miocene, the Rio Grande endit at the soothren end o the Rio Grande rift in Loch Cabeza de Vaca. Aboot ane million years ago (mya), the stream wis "captured" an began tae flow east. Navigation wis active durin hintle o the 19t century, wi ower 200 different steamboats operatin atween the river's mooth close tae Brownsville, an Rio Grande Ceety, Texas. Mony steamboats frae the Ohio an Mississippi rivers wur requisitioned bi the US Govrenment an muived tae the Rio Grande durin the Mexican War in 1846. Thay providit transport for the U.S. Airmy, unner General Zachary Taylor tae invade Monterrey, Mexico, via Camargo Municipality, Tamaulipas. 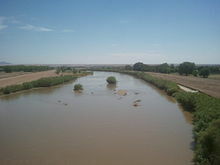 Airmy engineers recommendit that wi smaw impruivements the river coud easily be made navigable as far north as El Paso. Those recommendations wur niver actit upon. The Brownsville & Matamoros International Bridge is a lairge swing brdg that dates back tae 1910 an is still in uise the day bi automobiles an railwey trains, connectin Brownsville, Texas wi Matamoros, Tamaulipas. It haes no been opened syne the early 1900s houiver, when the last o the big steamboats disappeared. The brig is nou operatit bi the Brownsville and Matamoros Bridge Company, a jynt ventur atween the Mexican govrenment an the Union Pacific Railroad. At the mooth o the Rio Grande, on the Mexican side, wis the lairge commercial port o Bagdad. Durin the American Ceevil War, this wis the anerly legitimate port o the Confederacy. European warships anchored affshore tae maintain the port's neutrality, an managit tae dae sae successfully throuoot that conflict, despite occasional stare douns wi blockadin ships frae the US Navy. It wis a shallae draft river port, wi several smawer vessels that hauled cargo tae an frae the deeper draft cargo ships anchored aff shore. Thir deeper draft ships coud no cross the shallae saundbar at the mooth o the river. The port's commerce wis European militar supplies, in exchynge for bales o cotton. The Upper Rio Grande near Creede, Colorado. In the 1800s, the river markit the disputit border atween Mexico an the nascent Republic o Texas; Mexico markit the border at the Nueces River. The disagreement providit pairt o the rationale for the US invasion o Mexico in 1846, efter Texas haed been admittit as a new state. Syne 1848, the Rio Grande haes markit the boondar atween Mexico an the Unitit States frae the twin ceeties o El Paso, Texas, an Ciudad Juárez, Chihuahua, tae the Gulf o Mexico. As sic, crossin the river wis the escape route uised bi some Texas slaves tae seek freedom. Mexico haed leeberal colonization policies an haed abolished sclavery in 1828. In 1944 the US an Mexico signed a treaty regardin the river, an in 1997 the US designated the Rio Grande as ane o the American Heritage Rivers. Twa portions o the Rio Grande are designatit National Wild and Scenic Rivers System, ane in northren New Mexico an the ither in Texas, at Big Bend National Park. In the simmer o 2001, a 328-foot (100 m) wide saundbar formit at the mooth o the river, markin the first time in recordit history that the Rio Grande failed tae empty intae the Gulf o Mexico. The saundbar wis subsequently dredgit, but it re-formit amaist immediately. Spring rains the follaein year flushed the re-formed saundbar oot tae sea, but it returned in the simmer o 2002. As o the faw o 2003, the river ance again reaches the Gulf. View o the Rio Grande frae Owerleuk Park, White Rock, New Mexico. The Unitit States an Mexico share the watter o the river unner a series o greements admeenistered bi the International Boundary and Water Commission, US-Mexico. The maist notable o thir treaties wur signed in 1906 an 1944. The IBWC traces its institutional roots tae 1889, when the International Boundary Committee wis established tae maintain the border. The IBWC the day allocates river watters atween the twa naitions an aw, an provides for flood control an watter sanitation. Uise o that watter belangin tae the Unitit States is regulatit bi the Rio Grande Compact, an interstate pact atween Colorado, New Mexico, an Texas. The watter o the Rio Grande is ower-appropriatit: that is, thare are mair uisers for the watter than thare is water in the river. Acause o baith drocht an oweruise, the section frae El Paso dounstream throu Ojinaga wis recently taggit "The Forgotten River" bi those wishin tae bring attention tae the river's deterioratit condeetion. Thare are a nummer o dams on the Rio Grande, includin Rio Grande Dam, Cochiti Dam, Elephant Butte Dam, Caballo Dam, Amistad Dam, Falcon Dam, Anzalduas Dam, an Retamal Dam. In soothren New Mexico an the upper portion o the Texas border segment, the river's discharge dwindles. Diversions, mainly for agricultural irrigation, hae increased the natural decrease in flow sic that bi the time the river reaches Presidio, Texas, thare is little or nae watter. Below Presidio the Rio Conchos restores the flow o watter. Near Presidio the river's dischairge is frequently zero. Its average dischairge is 178 cubic feet per second (5 m3/s), doun frae 945 cubic feet per second (27 m3/s) at Elephant Butte Dam. Supplementit bi ither tributars the Rio Grande's dischairge increases tae its maximum annual average o 3,504 cubic feet per second (99 m3/s) near Rio Grande City, Texas. Lairge diversions for irrigation belaw Rio Grande City reduce the river's average flow tae 889 cubic feet per second (25 m3/s) at Brownsville an Matamoros. The major international border crossins alang the river are at Ciudad Juárez an El Paso; Presidio, Texas, an Ojinaga, Chihuahua; Laredo, Texas, an Nuevo Laredo, Tamaulipas; McAllen, Texas, an Reynosa, Tamaulipas; an Brownsville, Texas, an Matamoros, Tamaulipas. ither notable border touns are the Texas/Coahuila pairins o Del Rio–Ciudad Acuña an Eagle Pass–Piedras Negras. The Rio Grande (Rio del Norte) as mappit in 1718 bi Guillaume de L'Isle. Río Grande is Spainyie for "Big River" an Río Grande del Norte means "Great River o the North". In Inglis an Scots, Rio Grande is pronooncit aither /ˈriːoʊ ˈɡrænd/ or /ˈriːoʊ ˈɡrɑːndeɪ/. Acause río means "river" in Spainyie, the phrase Rio Grande River is redundant. In Mexico it is kent as Río Bravo or Río Bravo del Norte, bravo meanin (amang ither things) "furious" or "agitatit". The fower Pueblo names likely predatit the Spainyie entrada bi several centuries. Rio del Norte wis maist commonly uised for the upper Rio Grande (roughly, athin the present-day borders o New Mexico) frae Spainyie colonial times tae the end o the Mexican period in the mid-19t century. This uise wis first documentit bi the Spainyie in 1582. Early American settlers in sooth Texas began tae uise the modren 'Inglis' name Rio Grande. Bi the late 19t century, in the Unitit States, the name Rio Grande haed acome staundart in bein appleed tae the entire river, frae Colorado tae the sea. Bi 1602, Río Bravo haed acome the staundart Spainyie name for the lawer river, belaw its confluence wi the Rio Conchos. The lairgest tributar o the Rio Grande bi discharge is the Rio Conchos, which contributes amaist twice as hintle watter as ony ither. In terms o drainage basin size the Pecos River is the lairgest. ↑ 2.0 2.1 2.2 2.3 2.4 Metz, Leon C. "Rio Grande". The Handbook of Texas Online. Retrieved 17 July 2010. ↑ 4.0 4.1 "Rio Grande NASQAN Program". United States Geological Survey. Retrieved 17 July 2010. ↑ "Water Bulletin Number 75: Flow of the Rio Grande and Related Data; From Elephant Butte Dam, New Mexico to the Gulf of Mexico". International Boundary and Water Commission. 2005. Retrieved 17 July 2010. ↑ 8.00 8.01 8.02 8.03 8.04 8.05 8.06 8.07 8.08 8.09 8.10 8.11 8.12 8.13 "2003 Annual Report" (PDF). International Boundary and Water Commission, United States and Mexico. Retrieved 7 July 2010. ↑ Tom Lea (1957) The King Ranch writes that Richard King made his fortune as a riverman on the Rio Grande afore he proposed marriage tae Henrietta an stairtit his cattle ranch. ↑ "Bibliography on Water Resources and International Law: Rio Grande". Peace Palace Library. Retrieved 2010-12-23. ↑ "Devils River Protection Campaign, Devils River Conservation Easements". The Nature Conservancy. Retrieved 22 July 2010. ↑ "The Rio Conchos: An Essential Ribbon of Life". Environmental Defense Fund. Retrieved 20 July 2010. ↑ 21.0 21.1 "Water resources data for the United States, Water Year 2009; gage 08353000 Rio Puerco near Barnardo, NM" (PDF). USGS. Retrieved 21 July 2010. ↑ 22.0 22.1 "Water resources data for the United States, Water Year 2009; gage 08329000, Jemez River below Jemez Canyon Dam, NM" (PDF). USGS. Retrieved 20 July 2010. ↑ 23.0 23.1 "Water resources data for the United States, Water Year 2009; gage 08317200 Santa Fe River above Cochiti Lake, NM" (PDF). USGS. Retrieved 21 July 2010. ↑ 24.0 24.1 "Water resources data for the United States, Water Year 2009; gage 08290000, Rio Chama near Chamita, NM" (PDF). USGS. Retrieved 21 July 2010. ↑ 25.0 25.1 "Water resources data for the United States, Water Year 2009; gage 08249000, Conejos River near Lasauses, CO" (PDF). USGS. Retrieved 21 July 2010. Horgan, Paul (1991). Great River: The Rio Grande in North American History (4th ed.). Hanover, NH: Wesleyan University Press. ISBN 0-8195-6251-3. Wikimedia Commons haes media relatit tae Rio Grande (river). 1854 map of Rio Grande entrance (hosted bi the Portal to Texas History). This page wis last eeditit on 21 Julie 2018, at 06:09.